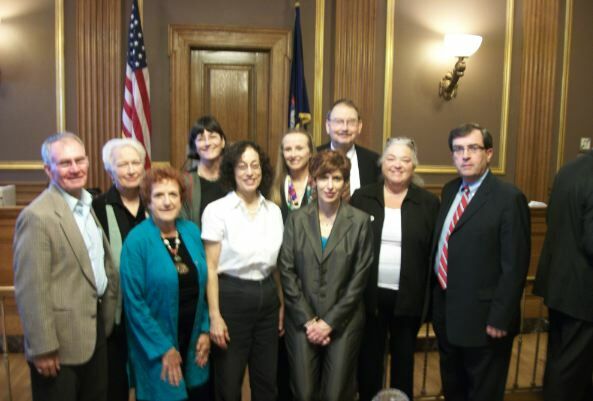 Judicial Delegates from Columbia County attended the Judicial District Convention Friday at the Albany County Courthouse to nominate candidates for the office of Justice of the New York State Supreme Court. 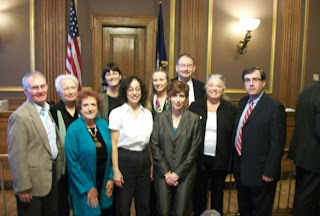 Judicial delegates attending the convention were (back row) Doug McGivney, Kinderhook, Joyce Thompson, Taghkanic, Robina Ward, Hillsdale, Virginia Martin, Stockport, Judge Raymond Elliott, Cyndy Hall, Chair, Columbia County Democratic Committee and Judge Thomas Breslin. (front row) Dianne Klinger, Chatham, Carol Sacks, Copake and Rose Aulino, Copake. Judge Thomas Breslin of Albany County and Judge Raymond Elliott of Rensselaer County were unanimously endorsed as candidates for the November election and will appear on the Democratic line on the ballot.